The Boulton Paul P.120 was a British research aircraft produced to investigate delta-wing aerodynamics in the early 1950s. It was very similar to the tailless Boulton Paul P.111 apart from having a horizontal tailplane. The P.120 followed the earlier Boulton Paul P.111 delta-wing experimental aircraft. It was produced for the Air Ministry to specification E.27/49 and differed from the P.111 in having a swept fin and rudder with horizontal tail surfaces high on the fin to improve longitudinal and directional stability. It had essentially the same wing as the P.111 in the latter's greatest span configuration, an unclipped delta; the wing tips of the P.120 were not removable or replaceable, but they could be rotated differentially or together for lateral or longitudinal trim. Just inboard of these tips the P.120 gained a pair of wingfences. The fuselages of the two aircraft were also identical, except towards the rear. Test flying took place at Boscombe Down. 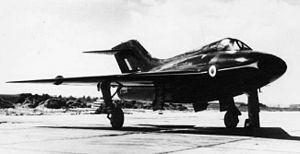 Although there had been a problem on its first test flight on 6 August 1952 test pilot "Ben" Gunn when the tailplane incidence required for takeoff in the available distance was misjudged, the P.120 had exhibited pleasant flying characteristics over 11 hours of flight time. Shortly before the Farnborough Air Show of September 1952 the previously unpainted P.120 received a gloss black (with yellow trim) finish and immediately gained the nickname "Black-Widowmaker." On 28 August Gunn encountered severe flutter which led to the loss of the whole port elevon. Unable to keep the aircraft flying and despite the dramatic nickname he ejected safely, making the first ejection from a delta winged aircraft though the P.120 was lost. Although plans were made to convert the earlier P.111 to the P.120 configuration, a decision was made to suspend further development, making the P.120 the last Boulton Paul design to fly. Data from Brew 1993, p. 307. The performance figures are those of the P.111, based on the similarity of the two aircraft. The P.120 never exceeded about 450 kn in its 11 hrs of flying. Brew, Alec. Boulton Paul Aircraft since 1915. London: Putnam, 1993. ISBN 0-85177-860-7. Jones, Barry. British Experimental Turbojet Aircraft. London: Crowood, 2007. ISBN 978-1861268600.